This will setup the CI::Reporter and place the XMLs in the "results" directory for us. Now click Save and go test it out... Select your newly created job from the Dashboard. If you have a failure, you can drill down by clicking the "Test Result" link on an individual build's page. If interested, there is a way to create plugins for Hudson. Some updates have been made based on comments from Mike Herrick and others using this setup procedure. Let me know if you run into other issues with this post and I'll update for future reference. Excellent post. 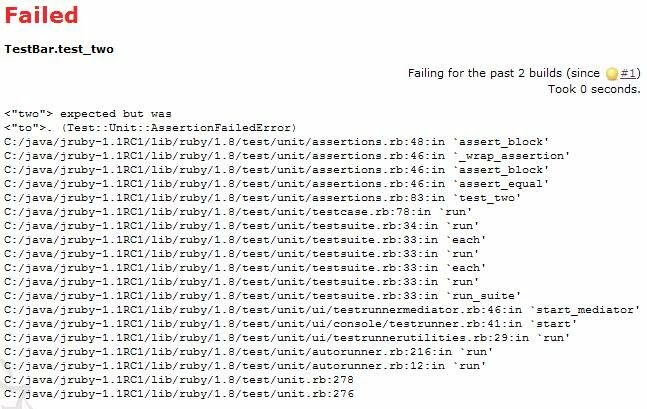 I hope it would help to set up JRuby's own Hudson builds system with proper test reports. Thanks for this, it works great. Have you looked at our Parabuild at http://www.viewtier.com/products/parabuild.htm ? It is a bit easier to set up and it provides more extensive statistics. When attempting to run the rake command, it tries to run the tests but eventually stops with an error along the lines of "could not find/load file" and some messages about ActiveSupport, etc. It seems that the 1.5.1 version of CI::Reporter claims to have fixed a similar error. I'm running JRuby 1.1.3 and also tried 1.1.4 but with the same result.